No Land Grab: TODAY: Rally Against Eminent Domain Abuse! 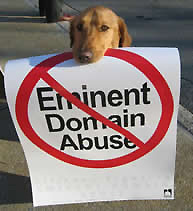 TODAY: Rally Against Eminent Domain Abuse! The City wants to destroy the slave safehouses from the Underground Railroad to create underground parking. An engineering firm called AKRF (which is also Ratner's and the Yankee's firm) wants to rewrite history, and we need to make a lot of noise to make sure they don't destroy one of Brooklyn's important historical landmarks. The rally is being hosted by one of our great community activists, Joy Chatel, and FUREE, a group that has been vocally defending the rights of public housing residents and other issues of economic racism. The rally will include: * tours of the site, * speeches by community advocates, * food, * music, and * dancing. It will be part street party, part political education, and fully about creating community!